Many saw this coming, including most in BJP. So do me as well. In a bizarre turn of events, it was expected of Nistish Kumar to do something utterly stupid which may and will have strong reparations for him and his party in the long run. Well may not be that long since 2014 general elections is just round the corners. If you ask me, what are my specific feelings of this split; I would rather put it in very simple and clear terms. I am happy. But before I elaborate why I am exactly happy seeing the NDA numbers getting reduced further, let us first look at Nitish Kumar as an individual. For those whom this split came as a surprise; isn’t ditching a regular habit of Nitish Kumar? He first ditched Lalu, then the founding father of Samata Party, George Fernandes and now eventually the party which made him the Nitish Kumar from a routine rambling, Kurta tearing nameless regional leader. He always was a seasoned trouble maker from the days JD(U) attached itself with NDA for personal gain. He always has this habit of besetting issues out of nowhere so as to keep himself and his party’s relevance in whole of this NDA dynamics. Be it spewing venom against LK Advani at the start of the alliance or their continuous nonsense against Narendra Modi, Nitish Kumar along with his party boss Sharad Yadav were at it all this while. For the sake of a mere 20 number of seats, Nitish Kumar was always a frontrunner in blackmailing BJP and other senior NDA constituents every now-and-then to tow their lines. I am glad that, finally such political blackmailing has its end, though it could have been in a more civilized manner than the unceremonious way it finally ended. 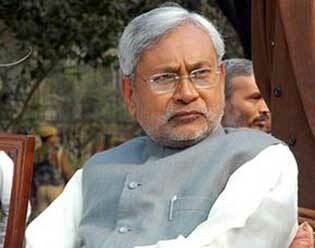 Along with a seasoned ditcher, Nitish Kumar proved how big a hypocrite he is. The man, whom he seems so fond of now, is the one who always was at the center of all his criticisms till recent past. When Goa happened, though BJP should have done that a long time back, it was Nitish’s party which was the first to term that as a BJP’s internal matter. All looked as normal business or at least Nitish tried to make it look that way initially. I pity on the political Gurus and our paid media to miss the despicable hidden intent in Nitish Kumar’s utterances. Little one thought that Nitish was in lookout for an excuse. And didn’t LK Advani provide that in a platter? The same Advani who was a communal bot for JD(U) all this while suddenly turned a darling once the resignation letter was exchanged with Rajnath Singh. From nowhere Sharad Yadav unexpectedly found it uncomfortable to stay with NDA since he had this alliance pact with Vajpayee and Advani. As per him it is no Advani; no Vajpayee; no NDA. And how fool it was on my part to think JD(U) always has an alliance with NDA, not with two individuals of BJP. The displeasure of Nitish or Sharad Yadav on the prospect of a missing Advani or inclusion of Narendra Modi shouldn’t have been there, had there been seriousness beyond vested interest in the whole alliance. A party is not run by couple of individuals, if you are not talking about Congress. It is expected for any democratically run party to have a change in leadership, as and when it is deemed fit for the party. I am not sure if in the pact, there was a clause prohibiting either Advani or Vajpayee to die even or else, change of guard is quite natural with everything. Old people do phase out and duly are replaced with newer lot. So when Sharad Yadav says, he can’t continue since Advani no more remains there to cajole him and Nitish Kumar, it more sound like a bad excuse than genuine concerns. It becomes even more surprising to fathom, a party which never found the elevation of NaMo as a problem initially, all of a sudden got jittery and that too all within a span of 6 days. While one may wonder what could have happened in these six days for a seventeen year old alliance to break up; in reality it is plain opportunisms, hypocrisy and a bad habit of ditching people that got the better of Nitish Kumar. Now here is the thing. Mamata Banarjee skirted the absurd federal front nonsense in these six days. In support of the nonsense, Naveen Pattnaik came out in open. Nitish Kumar or all of his spokespersons may not agree to admit in open, but given a chance, I would wonder who could be that politician who wouldn't want to be the priminister of this nation. I don’t blame Nitish Kumar, if he fosters any such dreams as he is well within his rights to have all such dreams as many times as he wants. Then shouldn’t he in that case speak out his clear intentions behind opposing NaMo than furnishing nonsense and excuses while splitting from BJP? That is where I find the Bihar chiefminister a hypocrite and liar of first grade. Being a leader of his stature or so as it is claimed by his party, the least expected from him was honesty and clarity in content; not absurdity and hypocrisy. No wonder why Nitish Kumar is feeling relived and getting so thankful for Manmohan Singh. People now may say, Congress party is wooing Nitish, but for me, the wooing is mutual and going on for quite some time. The day Nitish camped in Delhi demanding a special status for Bihar; the mutual wooing was anything but evident. To further the process of wooing, a notorious party like Congress, which seldom cares for non-congress led states, the demands of NK were accepted quicker than the time Nitish would have taken to jolt down all of that in a piece of paper. While similar demands of other non-congress ruled states are lying in the gutters, Nitish’s demands were taken on priority, even superseding the demands of one of their syndicates in crime, going by the name SP. While that was surprising for many that time, I saw what the real intent in such affectionate mutual back scratching. But there is a catch, before Nitish could be wooed in to the UPA folds. Since he spent a considerable time in BJP camp, he has to be certified of his secular credentials before he could be employed as another of Madam’s trusted sycophants. 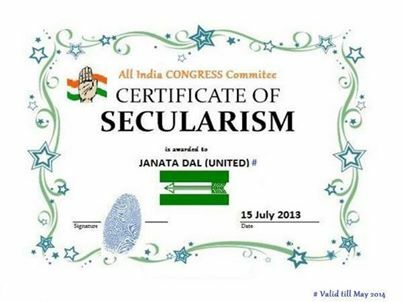 And for all such certificates, none in the world better qualifies than the Congress party itself. Like the international ISO standard, Congress has built a solid reputation of identifying seculars from the crowd. This specific ability of Congress to find seculars in a room full with communal idiots has made them identify jewels in the field of secularism like Lalu Prasad Yadav and Mulayam Singh Yadav. So the masters in recognizing seculars didn’t let down yet again by their powers of observation to see the secular avatar of Nitish Kumar and that too in double quick time. So no sooner JD(U) broke ties with BJP, it was Manmohan Singh who was first to certify the secular credentials of Nitish Kumar and that is precisely when, I am told NK felt a lot relieved; a kind of reincarnation stuff after spending 17 years with the communal morons. 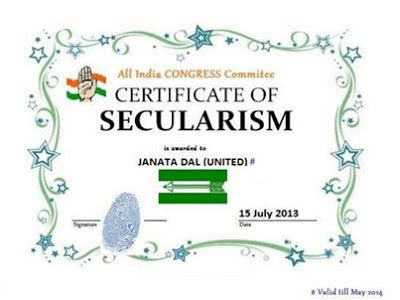 Please do glance at the certificate of secularism issued by Congress, not only to Nitish Kumar but the entire JD(U). Now coming back to, why I am happy. Everyone knows how NK became the CM of Bihar. With a paltry 38 MLAs with him, none would have expected Nitish Kumar to become the CM when the senior alliance member BJP has 67 of them. I feel sorry for Sushil Modi even now. Call it the payout of NDA alliance or plain bigheartedness of Vajpayee that NK is where he is now. Had BJP not shown generousness back then NK would still be an unknown face; exactly what he was in 2002. The undeserving CM post not only gave NK a face, it also allowed him to build his party JD(U) in BJP’s expense. From mere 38 seats to now 100+, the exponential rise of JD(U) as a party has got a good share of credit due for BJP. But look at how NK paid his dues. By backstabbing and playing rotten double speak. And the least we can do in our life is to keep ourselves far away from such dual standard morons, who would go to any extent for personal gain. I am happy, that such fake and non-ethical individuals are out of NDA. May look like a jolt for now but such hypocrites are bound to impart far bigger loss in future than the present benefit they may give. Good that such losses are duly sidelined before they could hamper more. And of course, the exit of JD(U) made sure that now none is there to spew lies and obstruct NaMo from being named as the NDA’s PM candidate. Even the country wants that to happen. Isn’t it? So a part of my happiness is for the nation as well. As they say, few people learn stuffs the bitter way and I see Nitish Kumar heading that way. Come 2014, he will learn the kind of mistake he did in the name of pseudo secularism. On back-stabbing, I would say..it is a routine in politics..even NaMo has back-stabbed Shankersingh Waghela, Keshubhai Patel and probably Advani. Also, BJP has no presence in many states and internal split may not allow them more than 100 seats..leave alone 200. How can they teach someone lesson? Talking about agreement between BJP (ie., ABV/ LKA) and JD(U) - if it was an agreement that JD(U) signed with 2 BJP leaders, then is it not George Fernandes who signed it on behalf of JD(U). How can Nitish own the agreement now?
" If you ask me, what are my specific feelings of this split; I would rather put it in very simple and clear terms - I am happy. " What is the total scam of first BJP Govt in K'taka ? $81 billions !!!!!!!!! Nitish is fully prepared to face loss in LS2014, dissolve the party JDU, and join Congress with his handful of JDU leaders post 2014 elections. He knows very well that he can realise the dream of becoming PM one day only if he is in a party like Congress. So what has happened now is only a trailer from him, and the real story will unfold only during the second half of 2014. Err - honestly speaking, you didn't expect Nitish to pull out - you say so in your earlier post. Neither did any person with common sense. We all gave the same reason, that pulling out of NDA would mean joining hands with UPA; and that would amount to political suicide in today's public mood. NDA under Vajpayee had 30 strong aliies, Present BJP leadership has ensured all are lost and now reduced to 2 only, NaMonia effect is so strong that it s not just allies running away but many seniors pushed against wall within BJP, a vertical split cannot be ruled out and BJP may end up becoming Gujrat regional party funded by private barons and Gujju NRI bhais !! Except 'Half' Shiv Sena and Terrorist Akali support BJP rest all have gravitated away from BJP towards UPA/Cong/third front !! Modi needed 600 strong policemen, water cannons, black flags and teargas to address a college in New Delhi ! !